Lower costs and reduce the time and effort traditionally required to manage your eDiscovery process. Easily inform, remind and confirm duties with employees, managers and IT to prevent spoliation, and automatically capture a record of diligent, affirmative action. Decrease the volume of unstructured data by targeting only the most relevant information for a particular case. Create forensically sound and defensible collections. Gain a list of employees to scope obligations specifically and reliably. Search for custodians based on custodian information or matter involvement. Or search the organization tree, select one or more departments and automatically build an employee list. Import custodian lists to manage large custodian numbers. You can also select and deselect to refine the scope. Add or remove custodians over time with a full audit trail. Easily inform, remind and confirm duties with employees, managers and IT to prevent spoliation and automatically capture a record of diligent, affirmative action. Use confirmations with automated response tracking to reduce risk and effort. Create notices from templates; simply add matter-specific elements. Route to attorneys for review. Use outside counsel more efficiently by pre-interviewing custodians electronically and reducing the scope of data collected and reviewed. Achieve higher reliability and control, with less legal and IT effort. Define and communicate preservation and collection instructions. Activities are automatically tracked, logged and made transparent for attorneys and appropriate IT staff. Pre-define criteria with IT across sources, so that legal fills in the blanks for IT and IT can expand the data source details required to fulfill data requests. Providing status indicators keeps everyone informed of responsibilities and next steps. 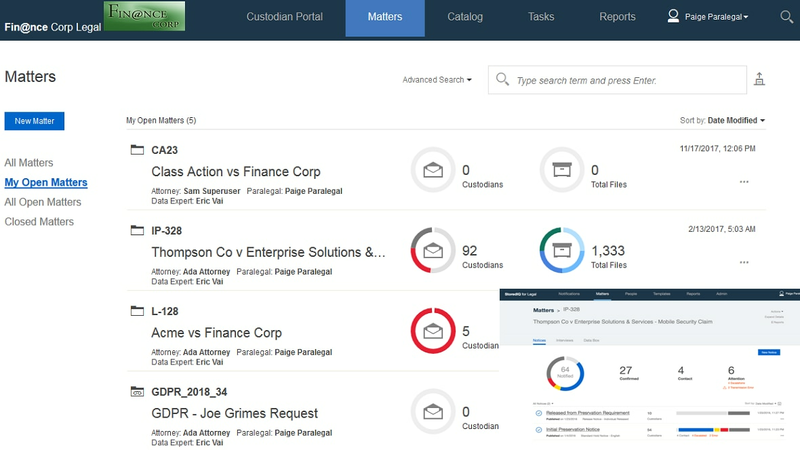 Automate the legal collection process from more than 75 data sources. Use a powerful search function to accelerate understanding of large amounts of unstructured content. Conduct forensically sound, fully audited collections and export. Improve user productivity by analyzing and managing data in place. Monitor, manage and mitigate risk with greater precision and less effort. Zoom in on exceptions that need attention. Track actions and produce reports. Drive down costs and ease compliance with a smarter approach to information lifecycle governance.